Families are growing every day, and some of you may need to know Our Pick For Best Car For Using 3 Car Seats. As you find out your expecting another child is on the way, one of your major concerns will be how to commute to and from doctors visits, daycare and more with three kids in tow. If you have younger kids, then they will all likely be in car seats. Protecting them and making it easy to get them in and out of your car is going to be a big issue. Space: Not only did we want something that had enough room for 3 car seats, we wanted something that offered the ease of fitting those seats all in one row. For many parents with small kids it is a hassle to get into a 3rd row to unbuckle children. Being able to get all 3 out of their seats easily is going to be a matter of not just ease but safety. Security Measures: Not only do we want to see a vehicle that has room for all 3 seats, we want one that has proper latching systems and we know will hold the seats safely in place. The safety belts and latching system in the Honda Pilot are superior to other crossover vehicles. You can feel safe knowing your children will be locked in safely. Crash Ratings: While the Honda Pilot isn’t the safest vehicle on the road, it does have very high crash ratings. With proper harnessing and safety seas and belts in place, it is easily one of the safer crossover vehicles around. Your children will be much safer in this vehicle than other similar styles should there be a crash. Price: Knowing most families looking for new car are on a budget, we looked at high end and mid range prices. This is a quality vehicle that falls into the mid price range, but has the characteristics and quality of a much pricier small SUV or crossover vehicle. It also offers extra room in the back for storage, groceries and more. When you find you will be adding a third child to your family, juggling 3 car seats in one car can be a challenge. The Honda Pilot is an excellent choice that will leave everyone happy and comfortable. Not only will your kids be safe, you will be happy with what you spent, how it looks and even the great gas mileage offered. 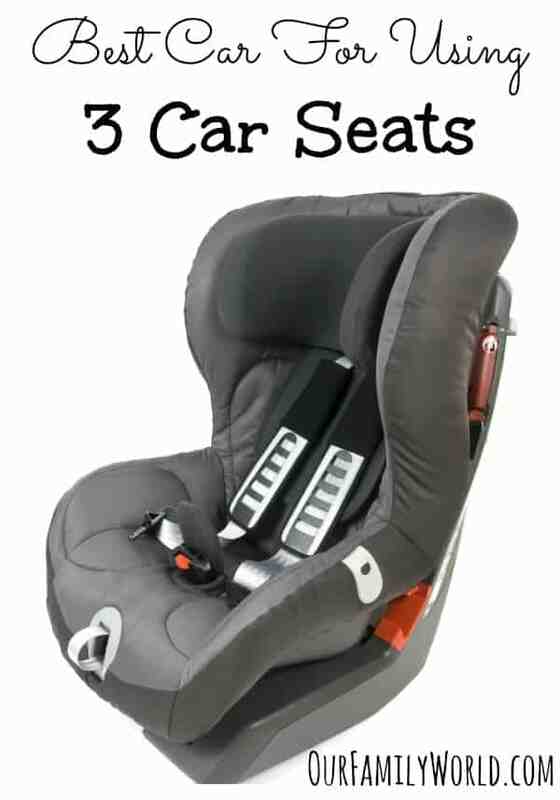 Do you have a different pick for the best car for using 3 car seats? Tell us about it in the comments! Our old van would fit 3 across, but wedged in there (Nissan Quest). The Pilot is a great choice as it is super-wide for an SUV. I have never had to even think about using three car seats. I had an Expedition once that could have easily handled them but I never had the need. Honda makes great cars. I will never need one that uses three car seats at once, but I do need something that has enough room for my kids and all of our dogs and keeps them safe. Wow, I never knew the Pilot was so versatile- I have a friend with 3 tots and she constantly has to 2 car it so I’m going to point her towards this article! We have three car seats and it has been a bit tough. I know my Little Man can move to a booster, but when he has a seat with a 5pt harness that still fits, why not, right? Another thing to consider is the actual child restraints, the Diono Radian is the slimmest convertible seat available, the Harmony Defender is a great slim combination seat. When we were buying a car last time, we brought the kids’ car seats with us to ensure that they would all fit. There aren’t a ton of options available for 3 car seats/booster seats. I’m glad you found one that works. We are huge Honda fans! I grew up with my parents driving Honda’s to a husband who loved Honda’s and now works for the dealership!! I agree the Honda is the best car for 3 carseats! My husband has a Honda Pilot and we love it. We’ve never had to put three car seats in it, but the Pilot certainly holds a lot of teenagers too! Sounds like a nice choice we looked at that vehicle but our big family has now moved to a 12 passenger van, i wish it had more latch systems but overall it’s safe and meets our families needs.